Tom and Matt started growing high quality, organic produce in Cheshire which made them question why vegetable stocks aren't made with mainly vegetables. 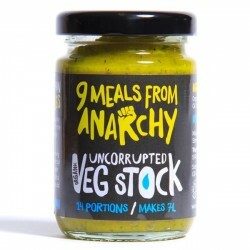 This led to them creating Nine Meals From Anarchy and the only Uncorrupted Veg Stock on the market. Their concentrated, organic veg stock has a vegetable content of over 75% in contrast to the majority which have no more than 7%. It also has half the salt of most available and is gluten free with no sugar or palm oil - completely uncorrupted, just the way a veg stock should be.